Yoga on the Road: More Yoga Airport Rooms are Popping Up! Seven U.S. airports now have yoga rooms so you can roll out your mat, de-stress, and re-energize! Granted - these seven airports represent a tiny fraction of all the airports you likely travel through or to in the United States. However, it's a good sign that yoga's popularity continues to grow! When I travel, I usually do post-flight yoga in my hotel room after I have unpacked and showered to refresh myself after several hours of flying. And, it feels SO good when I do this. Having an airport yoga room is a wonderful option for travelers who have long layovers between flights to work out the kinks and stiff necks and legs that we often get after sitting in those narrow airline seats for hours. Make note of these airports (I certainly have - their names are stored on my smart phone) and take advantage of their yoga rooms if you travel to them. Yours for taking your yoga practice with you as you travel! A Home Yoga Practice is Portable! My yoga at home practice is portable - even in a pitch black hotel room! A week ago I attended a 4-day information-rich conference, "Author 101 University," in Las Vegas. I had been trying to get to this conference for over 2 years. Finally a window of opportunity opened and I grabbed it! After telling a friend of my enthusiasm in finally being able to attend the conference, she decided to join me and split expenses which included sharing a hotel room for 4 nights. My concern was that I wake up early - before most of my colleagues because my morning regime of meditation and prayer, yoga, and aerobics usually takes at least and hour and a half. And, I did not want to disrupt my colleague's normal waking schedule with my regime. Fortunately, the hotel room was HUGE. I figured I could do my aerobics in the marble-floored gargantuan bathroom with ease and without disturbing my roomie. Also, because my gentle, slow hatha yoga prctice is quiet, I realized I could practice yoga poses in the dark without waking my roommate. 1) you may not find a suitable yoga class near or in your hotel (even though more places are offering yoga); 2) even if you find a class, the class schedule may not fit your travel schedule; and 3) you may not have the time to dress for and travel to a class while on a busy business trip. During last week's conference I attended sessions from 8:45 am each morning to 8 or 9 pm almost every evening. Morning and afternnon breaks were short and thus the only time I could practice yoga was at 5:30 am. So I did so - in the complete dark. Each night I rolled out my mat and set out my exercise clothes. In the morning, I used the flashlight app on my Iphone to move around the room and get myself ready for my practice. This took two minutes at most - I did not have to hop the elevator to go to a hotel gym that might not be open (the gyms at some hotels do not open until 6 or 6:30) or might already be crowded. I found it very soothing to do my yoga regime in the pitch black hotel room. It was like practicing with my eyes shut - I could easily focus on everything I was doing - no visual distractions. I chose not to listen to music on my iphone as I practiced. I basked in the absolute quiet and peace of the room. And, I am pleased to say that since I didn't turn on any light or make any noise, my roommate continued to sleep peacefully until she chose to get up. So I got to maintain my workout schedule and she enjoyed an undisturbed sleep. Therein lies the power of a developing a yoga at home practice - it gives you the power and freedom to practice yoga wherever you choose. Yours for practicing yoga while on the road. Yoga at Home for Beginners: Yoga On Travel -First Airport Yoga Room! Why does it seem that so many innovations come from California? Well, this past week, the San Francisco Airport opened what is reportedly the first airport yoga room! What a wonderful concept - especially for people who need a break to unwind and unkink their bodies on long multi-leg flights. Even if you fly first class and have wider seats and more legroom, being seated hours in the air can lead to stiffness in your limbs, shoulders and neck. I have given suggestions in past posts about how to sneak in some yoga stretches while in transit - but having an actual room in an aiport dedicated to yoga shows forward thinking of the best kind, in my view! Apparently, the airport director, a yogi himself who has practiced for 18 years and recognized yoga's benefits, responded to a recommendation by a traveler. The yoga room official opened two days ago but has been available to travelers for several weeks. Will other airports follow suit? Well, it required a significant financial investment and airports in other parts of the country where yoga is less popular may not see the value. But, I say kudos to this move! What a wonderful way to recognize the need to offer people a place to destress after or between long flights and to take their yoga practice with them! If I ever get out to San Francisco again (I have been there only once), I will certainly check it out! A few days ago, my business mentor told me about a woman, like myself, who fits in exercise in different moments of the day. He explained that this woman was in great shape and was known for her especially firm abdominal muscles. It turns out that years ago as a teen, her mother advised her to pull in her abdominal muscles every time she came to a stop light while driving. This constant practice that took her no extra time gave her great "compound interest" resulting in super toned and firm abdominals. Well, fellow beginning yogis, you can gain similar cumulative results by fitting in some yoga poses discretely while you commute daily to work on the metro train or if you travel on business by plane. You can do similar work on your abdominals by doing the complete breath and you can refresh your eyes by doing closed yoga eye movements. About 15 years ago when I facilitated a class at my church that included a chanting meditation technique, one of the men in the class revealed that he chanted omm and aahh aloud on the metro to and from work. What a brave soul! You would not likely catch me doing this as I really don't enjoy people staring or peering at me with raised eyebrows or a startled look. That's why I have recommended discrete yoga techniques such as the complete breath and the closed eye movement. Notice I did not suggest you do a facial yoga technique like the Lion because you may well hear a burst of laughter at best or notice some alarmed glances at you at worst! What is important here, however, is to notice different segments of the day where you can take advantage of moments here and there to fit in yoga. If you do so daily, you will reap enormous rewards. Instructions for the complete breath and closed eye movements follow below. Sit in a comfortable position on your mat or in a chair with your spine erect. Close your eyes to enhance the focus on your breath. Pull in your abdomen and exhale until your lungs are empty. Begin the complete breath by inhaling slowly and through your nose while expanding and pushing out your abdomen as far as you can. This causes the diaphragm to stretch downward and give your lungs more room to expand and fill with oxygen. This inhalation should take at least 5 seconds. For another 5 seconds, continue to inhale through your nose and now pull in your abdomen while expanding your chest. Expand your chest by pushing forward with your breastbone and spreading your ribs. Raise your shoulders an inch or two and hold your breath for 5 seconds. Begin exhaling through your nose while relaxing your shoulders and chest. Keep your abdomen taut. This completes one round of the complete breath. Number of repetitions: 3 complete breaths or doing these breaths for up to 5 minutes. Increases “prana” – i.e., the “life force” or energy in the body and all your organs. May increase resistance to colds. Increases clarity and alertness of mind. Strengthens and calms nervous system. These simple around-the-clock eye movements can also be done with the eyes closed. When the eyes are closed, the movements should be more relaxed and gentle. Never force your eyes to look to the farthest extent of their sockets. Sit in a comfortable position on your mat or in a chair with your spine erect. Or stand if you prefer. Keep your eyes closed throughout this exercise. Picture a large, ordinary clock in front of you with the numbers 1 to 12 in bold black. Look up at the imaginary number 12 on the top of your clock dial and stretch your eyes upward as far as possible in your sockets when practicing this technique. Begin moving your eyes clockwise around the imaginary dial stopping for one second at each number. Hold your head straight and motionless. When you have finished moving your eyes clockwise starting at 12 and ending at 12, perform the same movements going counterclockwise, i.e., moving from 12 to 11 to 10 and so forth. When you have returned to 12, close and rest your eyes. Pause for a few seconds before repeating the movements. Perform the eye movements in a complete circle 2-3 times alternating from clockwise to counterclockwise. Number of repetitions: 2-3 rotations in a practice session. Can also be done any time of the day to soothe and invigorate your eyes. Removes tension in the eyes. Relaxes the entire nervous system. Can relieve tension, headache, and eye aches. A few days ago, the Washington Post's Health & Science section had several articles that focused on the value of fitting in exercise and movements of some kind at the office. Over the years I have said that when your schedule is tight and you can't finish all your yoga poses at home, you CAN fit in certain ones into brief moments of the day at work! And, it's a good practice to insert some poses throughout the day regardless, especially if you have a sedentary (research/writing) desk job like mine! It's part of creating a yoga lifestyle. Although the photos above show me doing 4 poses (arm and leg stretch, neck movements, backward handclasp, and sidebends) in my home yoga studio, all of these poses can be slightly adapted for the office (or ladies' or men's room!). I regularly do the arm and leg stretch at work in the ladies room as long as I have relatively flat shoes. This poses helps to elongate your back and spine after sitting crouched over a computer for hours. You can also do the neck movements at your desk chair as long if you sit upright in your desk chair or if you stand tall The neck movements alleviate tension stored in your neck and shoulders that can come from sitting too long. The backward handclasp can also be done while seated or standing and it also helps to dissipate tension in your shoulders. And, finally, the side bends can be done at your desk or in the restroom as long as you're wearing clothing that allows you to bend from side to side. If you want to gain maximum results from yoga, you must (I am adamant about this!) make it an integral part of your daily lifestyle. And, that means inserting some poses into your day at the office if you possibly can. If you're creative and have a strong intention to do so, you will find that you can! A lot of people seem to have challenges with fitting yoga or any other exercise program into their daily lifestyle. 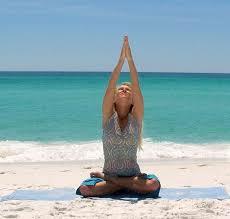 One wonderful aspect of yoga is that you can do a number of poses in a variety of places. Of course, unless you have your own private office (as this man probably does) you may not be able to do a headstand or a shoulder stand at work. However, you can fit in an arm and leg stretch, some soothing neck rolls, or alternate nostril breathing in moments throughout your day. One night, I went to bed too late - often my situation on busy Sunday evenings before a new work week. I have to admit, getting 7 hours or more of sleep per night often eludes me. Thus, the following day, I became drowsy in the midst of a writing project around 2:30 p.m., a segment of the day when my body clock droops, or should I admit, takes a nosedive. So, I decided to do three yoga neck rolls, a practice that I usually do in the morning. I focused on really getting into the rolls, s - l - o - w - l - y dropping my head forward and backward and then gently and smoothly from side to side. No rushing or jerking. After 5 minutes, I was raring to go! I totally revived and resumed my work. I often squeeze in yoga poses when I go to the restroom - as long as I am alone! I do forward stretches, side bends, and whatever I can do in a minute or two in work clothes. If I sometimes have to cut my yoga sessions a little short in the morning, I complete the rest of the poses in mini-sessions throughout the day in the ladies room or in my office. If you commit to a daily practice, you will find creative ways to stick with it. The results will delight you! Hatha Yoga for Beginners: Yoga Side Bends - Perfect for an Office Break! I have an sedentary day job. I research and write - ALL day. I just can't sit still for 8 hours. I have to get up and move about every 15 minutes. My office mate probably wonders why she hears a timer go off periodically in my cubicle. Well, it's because I like to work in 15 minute increments - especially when I am on a writing project. Fifteen minutes of writing and reading is all I can do before I need to move around. I probably have ADD - that condition that seems rampant in the United States. However, no medication for me! Instead, every 15 minutes I get up and stretch at my desk for at least a moment or two. About once or twice an hour I will slip into the ladies room (look - I drink a lot of water at my desk, too!) and do some yoga stretches. One of the easiest yoga stretches you can do in the office are the side bends. You don't have to change out of your business clothes (unless you are wearing a tight belt or some other form fitting clothes that don't allow free moment) to do this pose. The photo above shows a popular form of yoga side bends. I sometimes do this one and it can be intense - you really feel your sides stretching and firming up! I more frequently do another type of side bends that I learned years ago which involves standing straight, stretching both arms out to the side parallel to the floor, and then stretching over to the side so your arms form a vertical line and are parallel to your body. This pose is a bit easier to do than the one shown above but also tones and stretches your waist. I especially like doing the side bends as a break at the office because our body doesn't get stretched often in this direction! Unless you are a ballet or jazz dancer, I think it's unlikely that you're giving your waist the type of stretch that the side bends provide. So, add yoga side bends to your daily regime. It's an easy pose to slip into your schedule at the office! Simple Savvy Steps to Yoga Success: Airplane Yoga with Uma?! Yesterday, I came across an amusing article about airplane yoga -i.e. someone doing yoga poses in mid-flight across the country. Apparently, actress, Uma Thurman, brazen enough to start doing yoga poses in the middle of those narrow airplane aisles and in the flight attendants' station, stunned onlooking air travelers with her yoga moves. Hmm. Was it the yoga moves that stunned them or her celebrity status and long, lean physique? That remains a mystery. Kudos to Uma for being brave enough to keep up her poses in front of strangers. If it had not been Uma, however, I think the flight attendants would have swiftly escorted her back to her seat. Should you try this as a committed yogi? You can always give it a shot. I'd rather limit my mid-air yoga to breathing exercises, neck rolls, and a few limited stretches in the rest room. The remainder can be done in the comfort of my hotel room. One other point though - we can't totally give the thumbs up to Uma. Fellow travelers report that shortly after the plane landed, Ms. Uma rushed off to take a smoke. Total thumbs down to that. Yoga won't prevent smokers from lung cancer! Simple Savvy Steps to Yoga Success: Yoga Taught at the BWI Airport? Wow, yesterday I thought I might be living in California, the state of innovation, where all new trends always seem to born and then slowly filter out to the rest of the country. And, maybe this practice started there, I don't know. But, I was fascinated to learn yesterday, that an airport parking facility, Airport Fast Park, at the Baltimore Washington International airport hired Baltimore Yoga village yoga instructors to teach relaxation techniques to harried Thanksgiving travelers who hop on the shuttle buses from the parking lot to the terminal! Today, I investigated further and also discovered that an airport parking facility in Austin offered the same yoga services today and yesterday. Although not everyone on board the airport parking shuttles was up for the deep breathing and limb stretching taught by the hired instructors, as one traveler, Ingrid Polk, exclaimed, "More people should be doing this stuff than taking pills." I could not have said it better myself. What a wonderful service! I wonder if they will do this at Christmas? If you are not traveling through BWI airport or other sites with such a wonderful service, just plan on taking a few moments in transit (unless you are driving a vehicle) during the holiday season to stretch, do neck rolls, or hatha yoga breathing techniques to sooth your traveling soul and achieve serenity in the midst of busyness. Gentle hatha yoga is perfect for unwinding and getting the kinks out of your body after an airplane ride. Actually, on those long cross-country jet rides, you can take a mini yoga break even in the restroom. I know, I know, it's not the most appealing venue. And, you certainly cannot do so for more than a minute or two. People may start banging on the door! But, doing one or two neck rolls can help alleviate the neck cramp you can getting from dozing off in an awkward position or merely just sitting in your seat for hours. When you arrive in your hotel room and unpack, nothing is nicer than maybe taking a quick rinse off shower to freshen up and then investing 5 to 10 minutes (or more) to do some hatha yoga stretches. If you didn't have a chance to do your neck rolls in the airplane restroom, now is your time. Follow them with a cobra - bow - locust (these poses will be explained in future postings) sequence that takes only 5 minutes or so. I have found the cobra and bow which are convex poses to nicely undo the cramping in my body that sometimes occurs from sitting in those narrow airplane seats. Gentle hatha yoga done on the road definitely helps you cast off the physical discomfort of travel. And, if you're on a business trip and involved in intensive work such as public speaking, gentle hatha yoga can restore your equilibrium at the end of a hectic business day meeting with lots of people. This past July I attended a business conference in Anaheim, California. In the exhibit hall I chatted with one of the seminar presenters about yoga. He shared that the evening before he rolled out his yoga mat after a long day and did a yoga routine to de-stress. He said the wonderful practice enabled him to follow asleep shortly thereafter and get a deep, rejuvenating night's sleep. I practiced yoga daily during this business trip and I did not suffer jet lag. Truly, your hatha yoga practice will travel! Wisdom of the Day: "You have truly learned how to do yoga only when you've become your own best teacher, which means being guided from within. "~Erich Schiffmann in Yoga - the Spirit and Practice of Moving into Stillness.